This is the seventeenth in a series of posts featuring speculative flash fiction in translation. The series highlights both new and established spec fic writers from around the world. Florin Purluca is a Romanian writer, living in Focșani, Romania. He has a master’s degree in Clinical Psychology and works in a psychiatric hospital in his hometown. 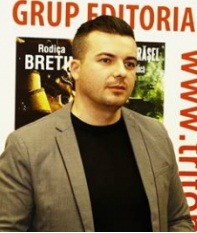 His fiction has been published in several Romanian periodicals, online and in paperback. Translations of his work have been published in Samovar, The Singularity, and Aphelion. He has published five novels so far. The signal that was accidentally received seemed ancient. It was encrypted–we were unable to decode it– but we managed to detect its source. We hoped it was The Signal that we’d been looking for for so many years. The automatic guidance systems lead us to WH-1086Y. The wormhole threw the ship into a relatively newly-mapped region, less than a hundred years ago, by one of our XVR probes. The part that we were most interested in was spread over an area of ​​ten parsecs and we arrived there in a relatively short time–thirty light years. Still under the reflection of an energy shield, we had no idea what the central location should look like. An orbital station, an asteroid? We passed through the shield and found out that it was an enormous aerodrome with a multitude of docks. It seemed abandoned. Well-kept, but desolate. Until the robotic ancillary system performed the complete set of docking maneuvers, we counted up to a hundred docks. We were not sure what we were going to find there, so we left our bodies on the ship wrapped in cables and completely immersed in hydroponic fluid, and decided to send our ghosts. The relays provided us with a strong halo-like connection spread over a hundred kilometers. That seemed enough to do the job. We hoped that the newly discovered station would have electro-gravitational guidance systems, otherwise we would slip through the floor right from the first step. We walked through several filter rooms, one by one, with a general feeling of anxiety and impatience at the same time, and found out that the main room was huge. Our receivers indicated ten square kilometers, with a single central control unit. Behind it was an engineer. We proceed with caution. He looked very old. A camouflage interface, we suspected. We walked toward the technician. The sensors did not interpret any clinical symptoms of possible hostile gestures. “Who are you?” the old man asked, when we were close enough to speak to each other. He spoke to us calmly and surely. “We are the Humans,” we said. He smiled and raised a hand gloved in wrinkled skin as a sign of greeting. “Finally! What took you so long? I am God. Nice to meet you!” He continued smiling, and, God, it sounded so familiar, as if you had heard your grandfather for the first time in years. “Yes, we know who You are.” We opened the envelope and gave Him the papers. “Sign here, please,” we added, trying so hard to hide our childish emotions. “What is all this?” He seemed very confused. After a moment of absolute silence, we turned around and walked back towards the ship. The old man remained mumbling with a shocked expression on his deeply wrinkled face. The way back home seemed so long and so sad, like the cosmos itself.